Divers and academics have offered a £1,500 reward for the safe return of a laptop containing precious survey data from a sunken battleship. The computer and back-up disks were taken from a flat at Stromness in Orkney at the weekend. 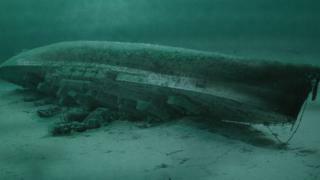 They contain months of work being used to create three-dimensional images of HMS Royal Oak in Scapa Flow. The project was for the 80th anniversary commemorations of the ship's sinking by a German U-boat. More than 800 men and boy sailors died when the ship was torpedoed in October 1939 by U47, which had slipped through the defences of the Royal Navy's supposedly secure anchorage. The project members have spent months working with the Royal Oak Association and the Royal Navy collecting data from the wreck along with video and photographs which were to be shared with relatives of those who were on the ship. Prof Chris Rowland, from the University of Dundee, was working to create 3D images from the data. He told BBC radio's Good Morning Scotland programme: "Losing the data that we've been processing is devastating to us. "We have a team of excellent volunteers who have dedicated their time, their money and their equipment to examining the Royal Oak." Emily Turton, who runs the Stromness-based dive boat Huskyan, has appealed to the thieves to return the laptop. She said: "Just from a data point of view, this is months of someone's time. "We are nearly in February. We have got a few months before this data was supposed to be ready to share with the families and the relatives of the people who died on that ship. "That's what they're doing. They're taking away the possibility of us giving as much as we were planning to give to that commemorative event in October. "Just hand it in, give the stuff back". The stolen laptop is a distinctive Schenker model. Also stolen were a Dell monitor and two powerful underwater lamps. When the Royal Oak was torpedoed in the early hours of 14 October most of the 1,200 crew were asleep below deck. Britain and Germany had been at war for just a few weeks. Scapa Flow was thought to be a secure anchorage but, under the command of Günther Prien, the submarine U47 had slipped undetected through its defences. A first salvo of three torpedoes was fired from the U-boat. Two missed but the one that struck caused those on board Royal Oak such surprise that many assumed the impact was an internal problem and not an attack. A second salvo failed to find its target, before a third saw all three strike the battleship. Less than 15 minutes later, the battleship disappeared beneath the water, claiming the lives of 833 seamen, more than 100 of them "boy sailors" aged under 18. Prien and his crew were able to slip away again, and were welcomed home as heroes but two years later U47 went missing in the Atlantic with the loss of all on board.